Did you know that French Polynesia is only 8 hours from Los Angeles? It is closer than you may think and well worth the trip. I am not particularly a “sit on the beach for a week” type of gal so I was excited to explore this destination in depth. There is so much more to do than just sit on the beach. Everyone speaks English (and French), the cuisine is fresh, and there are so many things to keep you busy! 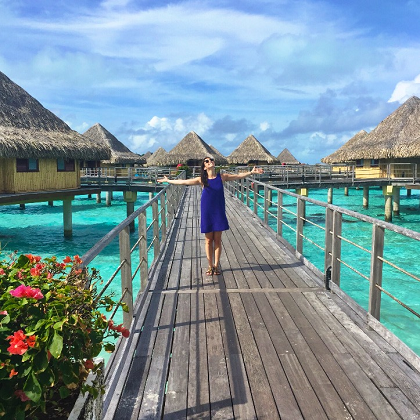 WHERE I STAYED: I visited several destinations including Tahiti (the mainland where you fly into and will most likely stay for a night due to the flight schedule), Moorea, Tahaa, and Bora Bora. TAHITI – The InterContinental is a large resort very close to the airport. A great option if you are arriving late at night and heading out early the next morning. Additionally, this is a great hotel to go to on your last evening for dinner and an authentic show. Instead of sitting in the airport (due to island connections), check out their nightly experiences. MOOREA – The Hilton Moorea is the only 5* option on the Island. I was so impressed with their service and the quality of the resort. Travelers that stay at other resorts will come to this hotel for the Toatea Creperie and Bar, so be sure to check it out. Le Meridien for their incredible customer service. I also love their Turtle Sanctuary and Ecology program. This was the first resort built in Bora Bora and has the best views of Mount Otemanu. St. Regis because I love their active experiences for biking – it is such a large property, that you can ride around on bikes from one area to the next. And there are always bikes at hand (imagine citi bike but on an island). The famous LAGOON by Jean-Georges restaurant is here so even if you don’t stay on property, it may be worth the trip over. Four Seasons because of their lovely staff and amazing Spa. They have an entire healing center on property with relaxation lounges, yoga, and more. WHAT I DID: Focusing on Moorea and Bora Bora, their main differences for activities are “land and water”. In Moorea, you can go ATV riding, Canyoning, and Hiking (to get in your workout). 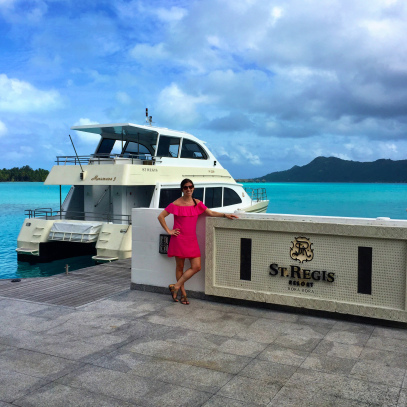 While Bora Bora has more of a focus on water based activities like Jet Ski-ing, Snorkeling with Sharks and Stingrays, and sailing. I recommend pre-booking your tours but all of the hotels have activity desks where concierge can assist in arrangements. All of the resorts had fitness facilities. Some, bigger than others. But my favorite way to stay active here was all of the water based activities. Not just in French Polynesia, but these are activities you can do at most beach resorts. I loved being able to Kayak and see all of the coral and fish. It was a great way to explore. One of my favorite water workouts is Stand Up Paddle Boarding. Did you know you could burn 300-over 400 calories an hour when recreationally Paddle Boarding ? The newest water activity I have seen is the water bike. 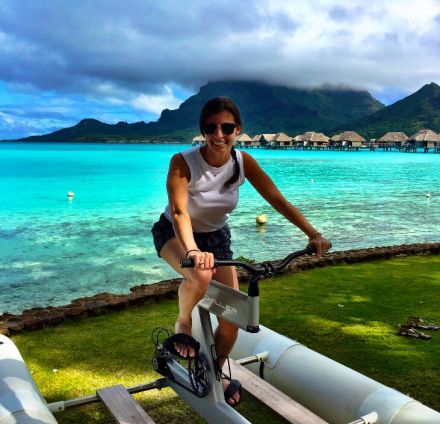 One of my favorite New York workouts is a Spin class, so where else would I rather ride than in tropical paradise?! Not many resorts have them just yet but if yours does, its worth trying out!